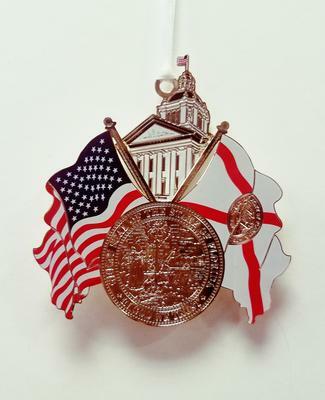 Representing both state and national pride, the 2017 Official Florida ornament is the perfect addition to your Christmas tree. Front and center is the Florida State Seal which is flanked by both the US and Florida flags, all set in a gorgeous, gold high gloss finish. The current State Seal was adopted in 1985 and features a Seminole woman, a steamboat, and the state tree: the Sabal Palm. Rounding out this superb, USA-made ornament is the iconic Historic Capitol cupola complete with line work representing the carved bas relief that greets every visitor. This symbol of state pride will be a welcome addition to any holiday gift.